A member of Villa supporter group Brigada 1874 tells of how the club has cast them aside after they had built a positive relationship last season and were making real progress. Visiting the Lower North stand for a change for the Swansea City game, it was sad standing there and looking up to the Trinity Stand and seeing it half empty. The wings of the Witton Lane stand and also the Holte End were very thin as well. The overall atmosphere was flat with very little intensity. The Swansea fans repeatedly sang “Is this a library?”. Despite this, the ever reliable K4 were on song, the Lower North chipped in and a pocket of fans at the front of the L7 were bouncing up and down, as their manager had asked fans to do before the game. The fans in L7 were the Brigada 1874 group currently banned from bringing in flags and ordered by the club to only stand when other fans stand. Despite this diktat, they wanted to support their team in their hour of need, while others stayed away from Villa Park. From my Lower North vantage point I saw that fans nearby L7, at the front of L8 & L9, were also getting involved with more active backing of the team, but I also noticed stewards and police repeatedly visiting the pocket of Villa supporters. While the back of the upper Holte, the whole of the Lower North and all the away fans stood for the entire match, some fans in L7 were told to leave the ground for standing for longer than just for ‘moments of excitement’. It seems now the Lower Holte has become a ‘family stand’, maybe that’s why the original family stand, the Trinity Road stand, has so many empty seats now!? L7 & L8 was announced last season by the club (in whispered tones) to be the ‘singing section’. A place where fans could let go a little in their support of their team. If the club had organised and communicated this with a little more conviction, supporters wouldn’t have to go through all this unnecessary hassle every home match. As the money received by Premier League football clubs from TV contracts has overtaken that received from supporters in the stadiums, the relationship between fan and club has changed. Where the terraces were once the playground of the football fan and a place where passion and pride found their voice, they have since been becalmed, sterilised by over-zealous policing, high ticket pricing and a health and safety diktat. It has conversely increased the growing chasm between supporters and the game in this country. It is against this backdrop of growing marginalisation of fans in England that the first seeds of a grass roots movement opposed to modern football were planted. It started at the likes of Crystal Palace, Swindon and Oxford, and then spread to a number of clubs throughout the country including Middlesbrough, Leicester and Man City. Mixing traditional elements of English support with the style of European ultra groups, this movement is still very much in its infancy. At the heart of these groups is a desire to bring back the soul of the English game. However their actions haven’t only been restricted to supporting their representative sides, some groups have also been active in rallying against the excesses of the modern game, whether that be in the form of protests over ticket prices, Sky Sports control over kick off times or the heavy-handed nature of policing at games. Having watched the development of other groups around the UK at the start of the 2010 fans at Aston Villa got together to propose the formation of an ultra group at Villa Park. Like those elsewhere in England, the aim of the group would be to show unconditional support for the team and to bring back some colour and vibrancy to the terraces. The start of the 2010/11 campaign saw Brigada 1874 make an appearance in the Holte End for the first time. Tucked away in the corner of L1, the group were very much on the periphery of the giant Holte End. Despite this we made what noise we could and put on a couple of displays throughout the season. The following year we decided to move to the slightly larger L8 area of the ground, this gave us more room as a group and also meant that displays would be more visible. 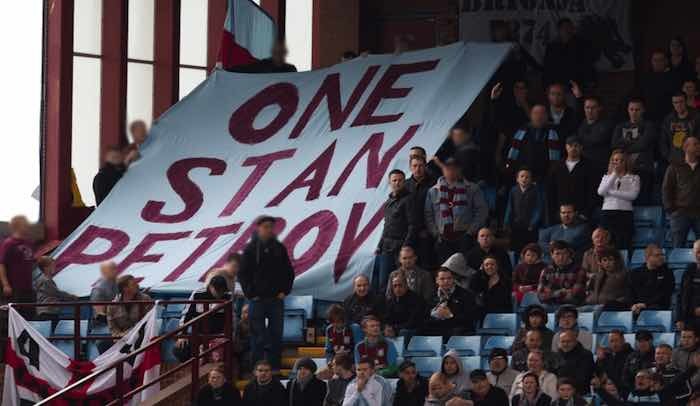 It was in L8 that the group started to encounter their first real problems with the club with the “One Stan Petrov” banner landing them in trouble. The banner had been made in the spring of 2012 and was unfurled on the 19th minute of every game the group attended; a picture of the banner was used on Aston Villa’s website to show fan’s support of the club’s captain. The following 2012-13 season, having received complaints from a handful of fans about their views being obscured, the banner was banned at the start of the 2012/13 season. This ban was flouted, both in L8 of the Holte and when the stewards became more determined to prevent it from being surfed, in the Lower North stand. This set the tone for the rest of the season, with an uneasy relationship existing between stewards and the group. In one incident against Sunderland, a tussle broke out when a senior steward attempted to pull down a banner display. The following season things got worse for the group when members were ejected from the ground for standing in the opening minutes of a cup game against Rotherham, this despite the fact that no other fans were stood behind them. This incident was a sad indictment of the modern game, but also of the increasingly poor relationship between Brigada 1874 and the club, however it also marked a turning point. The ejections during the game against Rotherham and the subsequent walk out by the group were the last major issues for some time between the group and the club and the following months saw a thawing of relations. The club apologised for the Rotherham incident and the stewards that had insisted on fans being thrown out of the ground for standing, were replaced by others who adopted a more hands off approach and the group was allowed to continue their style of support with little hassle. During this time the group enjoyed relative autonomy in L8, the only stumbling block being the club’s insistence on blocking around 20-30 seats from sale on the basis that people would migrate into the area without tickets, this often left a number of seats empty as fans were unable to move into the area without risking being moved out again by stewards. Click through to the next page for the club’s ‘Operation Noise’ initiative that welcomed Brigada 1874 in, created ‘Fight Like Lions’, only to then reject them. 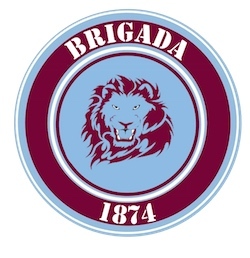 Seems like Brigada are a bit of a jinx , ever since they’ve been active at Villa the club has gone down the drain ….. I think it’s more to do with Mr Lerner and his CEO henchmen! In that case, do you know what a ‘hooligan’ is?! Erm…..well they could start by spelling our nickname correctly! Its VILLANS and NOT VILLAINS! If thats an indication of their mentality then I question their appearance at VP full stop! Just to repeat…..its VILLANS and NOT VILLAINS……start by correctly spelling VILLANS on your banner and then you may earn more respect! I’d have gone for ‘Villans’ personally. It’s the Villa way after all. Our knickname has been “Villains” ever since I have supported the club (58 years) , that’s why our cartoon caricature is a pantomime Villain as depicted on some of the metallic badges , Villan has no meaning , seems some people do not like tradition or culture …. Tom – maybe you want to take up your debate with the thousands and thousands of supporters who have always used ‘Villans’ to describe to Villa supporters. It is a tradition and culture of fans, before you start knocking other people. To all the thousands of Villains out there , in my opinion it is obvious that VILLANS is a misspelling of VILLAINS , phonetically they sound the same but what do they mean ? When I was a kid we described ourselves (tongue in cheek) as VILLAINS , a bit roguish , a bit edgy , bad guys ,a bit cheeky , rough diamonds but what is a VILLAN ? What are fans who describe themselves as Villans meaning to portray , is he just a Villa fan ? When other teams supporters hear that our nick name is Villans what does that mean to them ? Even spell checker agrees with me , just try it , type in VILLAN and then VILLAIN and see which one comes up with the red line under it , I rest my case. It’s ‘nickname’ BTW. It seems your spell check isn’t working! It is , it’s me having a grey moment. Yep eighties but not actually what came to mind – meant to say train (when I could still afford the train/trains were still affordable). Pre-condoms. Day after day we see the spin churned out on the official site, nothing worth even reading anymore, a well oiled money making machine fashioned by Randy Lerner. The treatment of supporters is another kick in the groin, to add to the shambles on the pitch, for which no one at the club accepts responsibility for, because the team management, who they appointed, take the can back for repeated failure, and walk away with a few million quid in their pockets, which ultimately, we finance. What they continue to count on, is our unwavering support, do they not realise that they are destroying that, attendances are dwindling, match day atmosphere is the worst I can remember since the season we were relegated to the old Div3. The club would be wise to remember, we are the lifeblood of the club, without us, there is no AVFC. When someone describes your football team as an “organisation” and questions whether you choose to support them or not then you have to wonder at their motivation, you don’t choose your team, the team chooses you, from nowhere an almost primeval force takes control of your emotions and you lose control of your faculties and reason. When someone thinks that a club is undeserving of it’s fans simply because of it’s lack of success on the football pitch then you have to ask yourself if this person is truly a supporter , does he understand what the love for the club really is ? Does he know the history , traditions and culture not only of the club but also of the people and the area that gave birth to the club ? When a group believes that they can manufacture “passion” amongst the fans by displaying banners , standing up , separating themselves from the main body of supporters then you have to ask if these people are really supporters at all ? Seems to me that you (UTV) do not know what the difference between supporting a club and loving the club is , when Villa were in the old third division my love for the club did not diminish , you however come across as the type of person that would support Man United because “they deserve” to be supported as a result of their success . I lived in the streets of Aston when it was mostly slums , people talk of deprivation today if they haven’t got Satellite TV , they don’t know what deprivation is but at least we had our team , almost a religion not an organisation like MOMS. Tom, I think we have our wires crossed here (so I will ignore your Man United paragraph). I purposely described it as an organisation to refer to the people running the club. I am talking about the middle management & board that have made poor decisions in recent years on many levels, some of which have been against the spirit of what Aston Villa is to its supporters. Semantics are tricky when you criticise those who are letting the club down and all the traditions and culture of which you allude to (which, I personally, am well aware of, thanks). When I say, the club were wrong doing this or that and they don’t deserve their fans, I’m NOT talking about the club or the team per se, but those who work there who are letting the club (and themselves) down. It is a job for them, but they perhaps don’t realise their true responsibility to fans in what has become an increasingly corporate and media infested industry. If they did, MOMS wouldn’t have come to be. Times have changed and football has lost a lot of the romanticism that you and I embrace and which fuels our love of the game. I’m sure, I am not over-stepping the mark, by saying Tom, we both love the game, but not the business. ‘Manufacture’ is an interesting term, in terms of atmosphere. The club (those who work at it) came up with the idea of ‘Operation Noise’ last season to do something about the lack of atmosphere on the Holte. That is a marketing team trying manufacture ‘passion’ for supporters. Although, in their defence, at least they were finally engaging with supporters to find a solution. Nowadays, Villa fans have largely become an apathetic bunch and it has very much affected the atmosphere of the ground, hence why supporters, who have been around at least three decades, bemoan the loss of how it was. The young lads of Brigada were an organic birth to try and do something about that and for your information, some of them live in the streets of Aston, as you once did. There is nothing manufactured about their banners, nor are they anything novel on the Holte. Go back through the decades and there’s always been witty, thoughtful and supportive banners made by Holte Enders. A lot of time and effort go into them, and it’s because they love their club. Those who work at football clubs now seem to have their focus on the kind of fan who comes for an occasional ‘life match experience’, these football tourists don’t mind paying higher ticket prices and they also tend to spend big at the club store. In terms of those who work at Villa, they promised supporters who wanted to support their team with more passion (and not just sit there and moan, ala many in the Holte), a designated section L7 & L8 to principally not disturb those who just come to sit (I can’t believe we are talking about the Holte End here). Those at the club have failed to deliver on their promise and fans have been left high and dry. It’s a shame that some supporters don’t think about the big picture (or the true picture) before they try to belittle others who are actually trying to get back what their excusers actually used to love about the Holte and going to Villa Park. And what politics may they be, that are so offensive? All politics should be left outside the ground , end of. What politics? The ONLY thing is they are anti-fascist, which means anti-discrimination. Which everyone should be going to any football game. If that’s politics and you want it out, then you’ll have to get rid of organisations like ‘Kick it Out’ who campaign against racism. It’s some people who say ‘no politics’ that tend to have the agenda, from what we’ve seen. They can be whatever they want to be the other side of the turn stile but if they bring their politics of whatever shade into the ground then it becomes divisive and really it’s all about supporting the club and not a party political broadcast. As for pressure groups like “kick it out” they are not needed , there are laws that deal with discrimination and insulting behaviour , trouble is some people have an agenda which surpasses sport , an insidious campaign of political expediency which is lost in the fog of innocent love for a team and that’s when I get angry. No, the PROBLEM is the people who come to games that are ignorant, insulting, discriminating, racist, homophobic and dumb. These are the ‘agendas’ that shouldn’t be at football grounds. It’s cause and effect. Which people are these ? Never heard any of what you are claiming , most of these problems are in your head, you are offering solutions to non existent problems. Oh really. Never any racism at Villa Park? Never any moaners insulting players? Yes , moaners insulting players and managers but never heard any racist or homophobic comments since the 1970’s. The singing was mainly enmass (Holte End) at home and everybody away, no mobile phones to arrange a punch up, no social media posting pictures of the burger you are eating, just waking up, trying to hitch a lift, or jump the train (very easy back then) lift a few cans from the nearest corner shop (Yep we were as bad as the scousers back then) and all stick together in the face of adversity. Maybe a stint in the chanmpionship won’t be such a bad thing after all! Like you I remember the old days when you could turn up and pay at the turnstile , 3 shillings (15p in new money) into the Holte end (no roof in those days) and then pay another tanner (2.5p) to transfer into the Trinity road stand if Villa were kicking towards the Witton end in the first half , returning to the Holte in the second half. Today I sit with my young Villains, family members who carry the torch for the next generation and we look with dismay at the usurpers in L7 trying to hijack our beloved club with their promises of “passion” , we don’t want your continental style “Ultras” with their flares , bands , banners and infuriating drums! A distraction and an orchestrated cacophony of self aggrandisement which has become more important than the football itself . And the reason for Brigada ? Why do they separate themselves from the main stream Villa fans in the Holte ?For ulterior reasons, political attention seekers hood winking the ordinary fan , where did they come from one asks , what is their purpose , why are they setting up affiliates at other clubs , who finances them, Why do they carry a banner expounding the slogan “my granddad shot fascists (actually my granddad shot communists , he was in the Korean war) the reason for all of this is the left (and they stand in the left of the Holte ) trying to dislodge the right from their hold on football hooligans. Well I am sick of it and it has become obvious to me that MOMS is just a mouthpiece for Brigada who in turn are just a recruiting sergeant for the rentamob UAF , you have been rumbled and your days are numbered at Villa , leave us alone let us enjoy our football in peace! Most of your points seem to be in your head. Times have changed and the business/marketing emphasis of the modern game have long eroded away the traditions and values you held dear. These guys were a reaction to that and the only reason they exist was to try and help wake up the Holte from its slumber and make it more fun. It was as simple as that. Times have changed but traditions and values are timeless and not subject to the vagaries of man , the so called “slumber” of the Holte will reawaken when the performance of the team on the field improves, flares and drums will not improve performance otherwise every coach in the land would be demanding it , most people do not go to the Holte to have “fun” they go to watch football of any standard as long as their team win , that’s what makes them feel good , it’s as simple as that. Bit complicated mate – used to be turn up, sing up, punch up. Chips, bus, MOTD. Yep, it feels stupid talking about all this stuff now, as back in the day it would have been laughed at. I completely preferred the simple life back then. No avalanche of BS media too, just a few newspapers and Shoot & Match magazine.